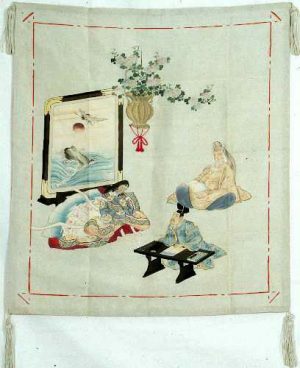 This is a remarkably simple, but elegant, Silk Fukusa, or formal gift cover, that has been hand woven of rare Chirimen Silk and hand dyed and painted with natural dyes. 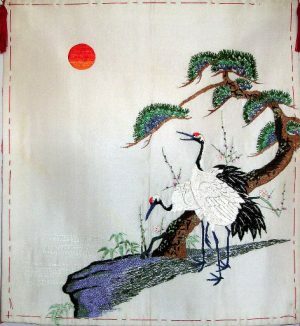 The design has been freely drawn in the paste resist dyeing technique of “Tsutsugaki” or the Rice Paste Resist method which entailed painting out the design in rice paste each time a new color was added to the design. 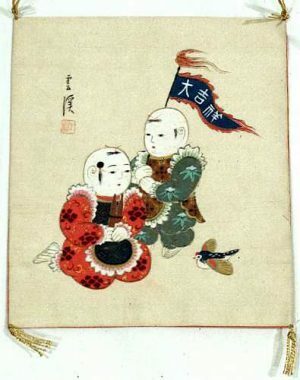 The reverse side is Chirimen Silk in a strong red color to accentuate the design message of long life and good fortune by the warding off of evil. Free style patterns based on natural phenomena are often the most recognizable as being distinctly Japanese, as their reverence for nature, particularly Mount Fuji, is part of their heritage and traditional Shinto Religion. 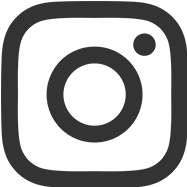 The emphasis is on a stylized version of nature, but a certain vagueness is preferred to absolute clarity in the rendition. The bird’s eye perspective results in a fluidity of design that represents an “orderly” version of nature. One of the most common of these patterns, incorporated within this scene, are the clearly distinguishable clouds which express dynamic motion. 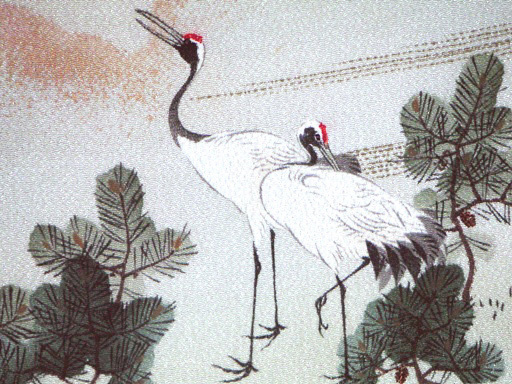 To counterbalance this activity are the Cranes (“Tsuru”) and stylized Pine (“Matsu”). 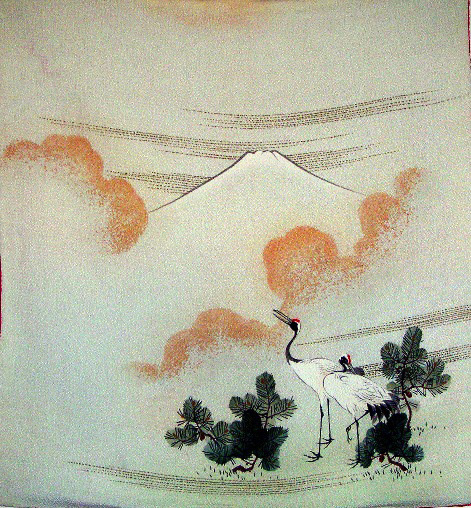 Both the Crane and Pine carry with them added symbolism. 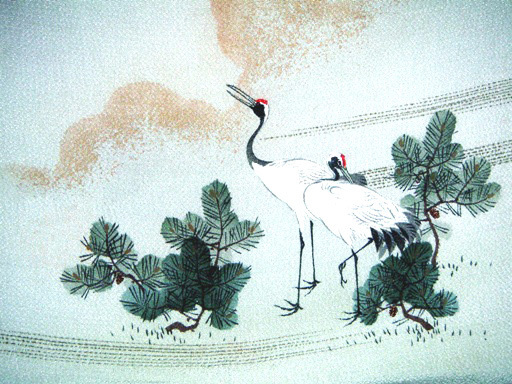 The Pine represents longevity, while the Mandarin Crane stands for good fortune and long life. 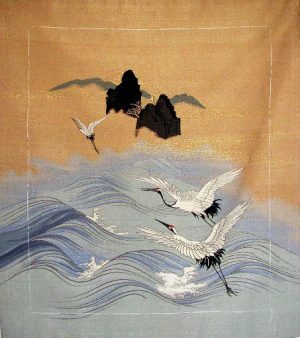 Chirimen Silk is an handwoven crepe like silk weave whose process can no longer be duplicated, as it has been lost to the Japanese for over 100 years. The Fukusa itself is in good condition although where the front is sewn to the back, there is some slight fraying. Fabulous wall hanging or framed art work. The Fukusa is actually 2 separate sides sewed together at the outer seam with the inclusion of the tassels and could easily be made into an extraordinary pillow.